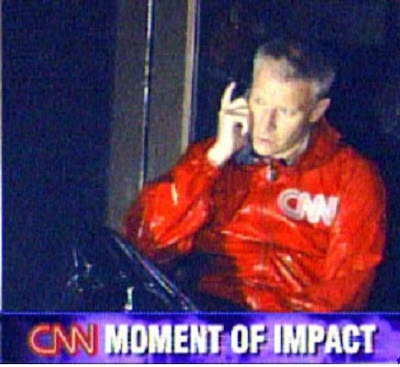 Anderson Cooper's Special Report on Katrina, The Storm That Never Stopped, finally aired on Thursday night. Anderson will be anchoring live from NOLA on Friday night, the eve of the 10th Anniversary of Hurricane Katrina. Anderson announced that he would be anchoring AC360 from NOLA on Friday night on the eve of the 10th Anniversary of Hurricane Katrina. 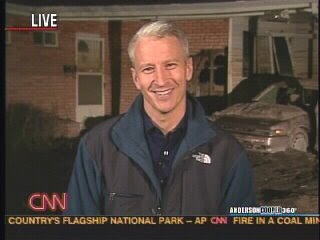 We will post video of Anderson's Katrina special tomorrow/Friday morning and cover Anderson anchoring AC360 from NOLA at 8pmET tomorrow/Friday night. Tonight we take a look back. The year is 2005 and Hurricane Katrina has just slammed into the Gulf Coast. Anderson Cooper is on the scene and filing reports ~ The quotes used in this post are from Anderson's book Dispatches from the Edge - A Memoir of War, Disasters and Survival. If you haven't read AC's book, I suggest you do and if it's been a while, it may be time to read it again. In the end, the real power of a hurricane isn't found in its wind speed. It's in what it leaves behind-- the lives lost, the lives changed, the memories obliterated in a gust of wind. Anyone who does hurricane reporting for any length of time knows all too well that standing in the aftermath of a storm is much more difficult than standing in the storm itself, no matter how hard the wind blows. When we get to Gulfport, the motion stops and reality sets in. It's worse than I imagined. The worst I've ever seen in America. ... Downtown Gulfport is in shambles. People stagger about with no shoes, licking at their tears. Tractor trailer trucks that have been flung about, lie in a pile like abandon children's toys. ... Next to the waterfront, a casino barge, a block long, sits on dry land. Through a gash in the side, silver slot machines sparkle. An urban search-and-rescue team walks by in the dying light in steel-tow boots, with lamps on their helmets, looking for anyone who may be alive. Anderson was live from Bay St. Louis on Wednesday night. He gave us an update on the desperate situation there and asked the question he had heard over and over again that day -- Where is the help? ...a woman named Sally Slaughterstops by to report a missing person. ... Slaughter knew that Christina Bane and her family didn't evacuate. ... Later, I learn the real reason they'd stayed: Bane's two sons were disabled, and she didn't want to go to a shelter where people would stare. .... Christina Bane is inside. So are Edgar and their two sons, Carl and Edgar Junior. All four are dead. Drowned. Sally Slaughter is crying. She's the only one. One of the searchers takes out a camera -- digital, downloadable -- and shoots pictures of the Banes. Click. Click. Click. Click. Another searcher takes out a Magic Marker. On the Bane's front door he writes V for victims. 4 DEAD. ... I never thought I'd see this here, in America -- the dead left out like trash. None of us speaks. There's nothing you can say. When you're working, you're focused on getting the shot, writing the story. You sometimes don't notice how upset you are. In Waveland, I certainly don't. Late Wednesday night, I'm talking to someone back in the office about the woman we left on the street, and I find myself crying. I can't speak. I have to call that person back. At first I don't realize what is happening to me. It's been years since a story made me cry. Sarajevo was probably the last time. I've never been on this kind of story, though, in my own country. It's something I never expected to see. I'm about to interview Senator Mary Landrieu. She's a Democrat from Louisiana. I'm unaware she's going to be on the program until a few minutes before she appears. Much of what we're doing on the air each night is impromptu. I like working that way best. No scripts, no TelePrompTer, just talking with the viewers-- no separation between me and the camera. Before I go on air each night, I have a rough idea what will be in the program: where our reporters are located and what they've been working on. During the broadcast, however, much of that changes, so I have to be quick on my feet, ready for anything. Just as we come back from commercial break, a pickup truck drives by. In the back a young man with a trucker hat holds up a tattered American flag. He salvaged it from the wreckage. He's tired and worn, but proud of that flag, proud that he and his family are still standing. We don't speak -- he is too far away -- but I look him in the eye and we nod to each other. In his face I think I detect betrayal and anger, but also strength and resolve. I'm on the air, but I find my self tearing up. My throat tightens;I'm almost unable to speak. I quickly try to move on to another story, and hope no one has noticed. Walking through the rubble it feels like Sri Lanka, Sarajevo, somewhere else, not here, not home, not America. I've covered a lot of disasters, natural and manmade and each one is different, each one the same.... At a certain point it feels like all the words have already been spoken, devastation, destruction, disaster, sadness and pain. Again and again it's always the same, the heat, the humidity, the sweat, the tears. This time does feel different. This time it's our home. And a harsh homecoming it is for some of the residents of Waveland. Anderson met up with a few and filed the following report. And it's been a privilege to be in Waveland the last two nights here, the people just remarkable, some looting here, yes, but people have just been helping one another, neighbor helping neighbor. The federal government is here. FEMA, these Virginia urban search and rescue personnel have just been doing extraordinary work and continue to. As the sun goes down, they'll continue to work. As the sun comes up, they'll be working again. Saturday, I leave for New Orleans. It's only about fifty miles from Waveland, but the drive takes several hours because of roadblocks and traffic. ... CNN has sent trucks from Atlanta with food and gas so we can operate independently for weeks. They've also sent two RV's so we'll have a place to sleep. .... When we enter the city, it feels like we're crossing a frontier. the farther we go the more we find stripped away. ... We head toward the Lower Ninth Ward. We wake each day unsure what lies ahead. Early in the morning, we gather in the lobby of the hotel. Few words are spoken before we head out. We climb into our SUV, a small platoon searching the city. The water recedes, new streets emerge, the map is redrawn every day. Some residents sill refuse to leave. On the street outside her two-room rental, I spot an elderly lady, overweight, overtired. She sits on a rusty metal chair and leans on a cane with the words LOVE MINISTRIES crudely carved into the wood. She stares straight ahead, but her eyes are clouded and seem to be focused somewhere just above the horizon. Her name is Terry Davis, but she says around here everyone calls her Miss Connie. "I'm legally blind," she tells me, "and they won't let me take my service dog with me." After a month, I reluctantly leave New Orleans. I head back to Mississippi for several days. John Grisham and his wife have begun raising money for rebuilding the Gulf, and they agree to meet me in Biloxi so I can report on their efforts. He suggests we meet at a restaurant called Mary Mahoney's. It's a Biloxi landmark that Grisham has included in several of his most popular books. Mary Mahoney's was badly flooded during the storm, and workmen are busy trying to get it reopened. I arrive before the Grishams and when I walk into the restaurant, the owner, Bob Mahoney, smiles and says, "Welcome Back." I sign off from Waveland, Mississippi. Tomorrow I'll return home. My office is insisting I come back, "at least for a little while." That's what they say, but I know it means it's over. They'll let me return, visit from time to time, do updates, but soon there will be other headlines, other dramas, and those who weren't here will want to move on. With Anderson on vacation and the very capable John Berman in the AC360 anchor chair, we thought we would bring you a couple of Anderson's early reports from when Katrina first made landfall. Tomorrow night we will cover Anderson's Special Report. Thursday and Friday we will be posting some retro posts of Anderson's coverage of the devastation brought by Katrina to Mississippi and New Orleans.